I think I'm going to make this a weekly series of what's new around here. Additionally, I intend to include other ramblings like things I found interesting on the internet this week or cool runs I did, kind of like a weekly synopsis. Originally, I was going to do this on Sunday and call it Sunday Synopsis but then I couldn't decide between Sunday Synopsis and Sunday Summary...so I did the only logical thing and decided to write it on Wednesday? It was at this point that I decided I would try to get on the site and see if I could even get through to the registration page. I would compare it most to when a new Apple product comes out and even though you don't really "need" it, you somehow manage to negotiate and reason to yourself why you do. That's what happened. I got in. I registered. Honestly, I could not be more excited! Not only did I PR last year at the Marine Corps Marathon but the run was so uplifting and inspiring, it took a lot to hold back the tears during the run. I'd say most marathons get emotional at some point. This was emotional the entire time. Watch the video if you don't believe me. So YEAH, I'M PUMPED! Or as they say, I decided to #Commit, either way this was my response! Unfortunately, not everyone was as lucky as I was to get in and register. I did get in several times and was unable to pay because I "didn't have an item in my cart" but eventually, after refreshing ~200 times on the iPad and laptop, it went through. The registration sold out in 2 hours and 27 minutes, breaking last years record of 2 hours 41 minutes. Despite preparation by the race organizers and Active.com, the registration processing company, the traffic was too much and lots of folks were not able to. Active issued a letter apologizing yesterday and went one step further to donate all proceeds to two foundations, the Wounded Warrior Project and Semper Fi Fund, probably out of good faith but possibly also as an attempt to maintain a contract with the Marine Corps Marathon in the future. 2. Cook-Eat-Repeat - For the most part, Michelle and I cooked, ate, and did school work the entire weekend. Mainly cooking and eating with a quick run Saturday morning and a lot less homework than we should have. I had originally planned to cook chicken in the crockpot on Thursday afternoon but school work got the best of me and I never got around to putting it in the crock pot. However, Friday I was more successful. I found a really simple recipe on Pinterest and decided to give it a try. Michelle cleaned and trimmed the chicken breasts while I prepared everything else. Pretty simple really. Garlic, chicken broth (we used low sodium), a celery stalk, diced onion and put it on high four 4 hours (although we only cooked it on high for 3 hours and it was done but we also cut down the chicken breasts so they would cook faster). While we waited, we made both guacamole and mango salsa. I actually didn't like guacamole until Cinco de Mayo last year when Michelle and I went out with some of my co-workers to a restaurant where they prepared it table side. I've been obsessed ever since. Around the 3-hour point, I pulled out one of the chicken breast to see if it was done all the way though and it was so we pulled it all out to shred it. Now here is where it gets REALLY exciting!!! 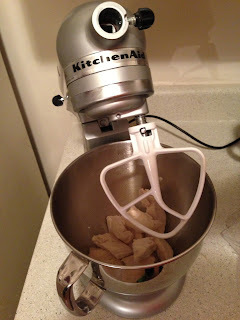 I had read on the comments of the recipe that you can put the chicken in a Kitchen-Aid mixer with the paddle attachment while it is still hot and it will shred...I had also read that people tried this and had sent chicken flying across the kitchen. I'm proud, and slightly disappointed, to say that there were no flying chickens on Friday night. But lets be honest - chickens can't fly! I took photos because I was so proud and it was SO quick, probably 10 seconds at the most! 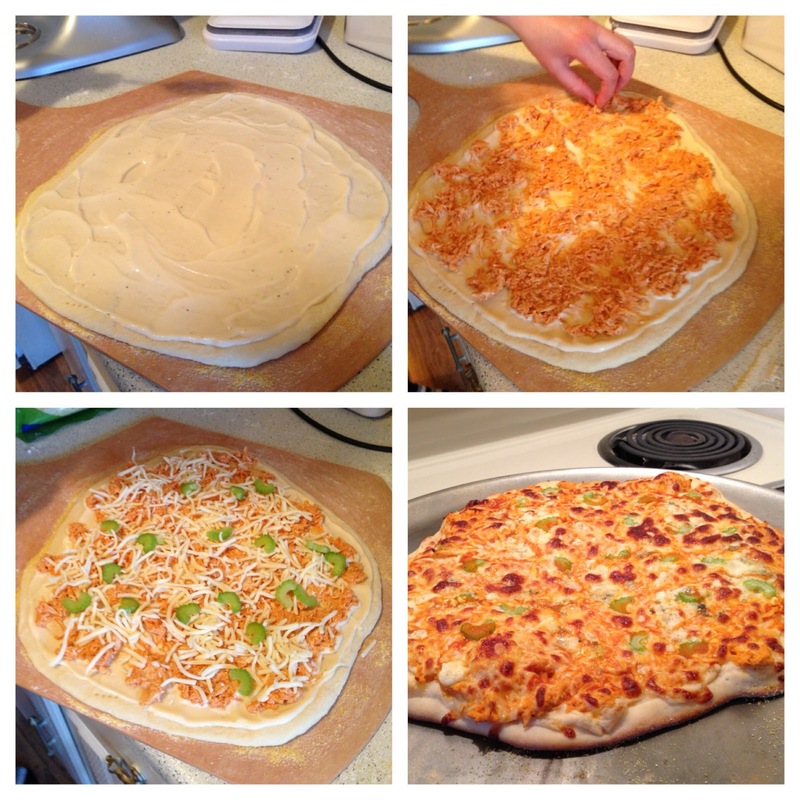 When we cook, we go all out. And that meant our kitchen was a wreck, as usual, because we were preparing steamed tortillas, imitation Chipotle rice, and black beans simultaneously for burrito night. I still have some work to do on the actual wrapping of the burrito but taste was great! Michelle managed to figure out the wrap and hers turned out really well! Saturday morning, I left early to head out to Jefferson National Forest, an awesome playground for outdoor enthusiast with a phenomenal trail system for runners and mountain bikers, for a group run organized by a local running store. Except...I was the only one that showed up. Maybe there's a rule about below freezing temperatures means no runs ?!? After some debating, the local donut shop and bed sounded much better than 10 miles in 30 degree weather, I decided to leave the warmth of the heated seats and headed out for a fun run. I managed to get in 10 GORGEOUS miles on the rolling trail of Poverty creek. A photo post-run. By this time it had warmed up to high 30's low 40's so shorts were appropriate. I actually got warm on the run and took off my gloves about an hour into it. We made an awesome breakfast after I got back and then got ready to meet some friends in town to grab lunch at Cabo Fish Taco. As I said, Cook-Eat-Repeat or more like Eat-Repeat. Saturday evening was much of the same, I was very proud of myself for coming up with ideas that would reuse the chicken we made Friday night but not force us to eat the same thing two days in a row. Over the holiday break, we made a lot of pizzas and can knock out a couple crusts in about 15 minutes from getting the mixer out to letting the dough begin to proof. Because of the leftover ingredients, buffalo chicken was the pizza of choice for the evening...and Sundays lunch. On Sunday, after Easter service, we actually managed to sit down and do school work like diligent graduate students. I had the best of intentions to get out for a run but after accomplishing some work we headed over to Michelle parents for Easter dinner and that was that. 3. 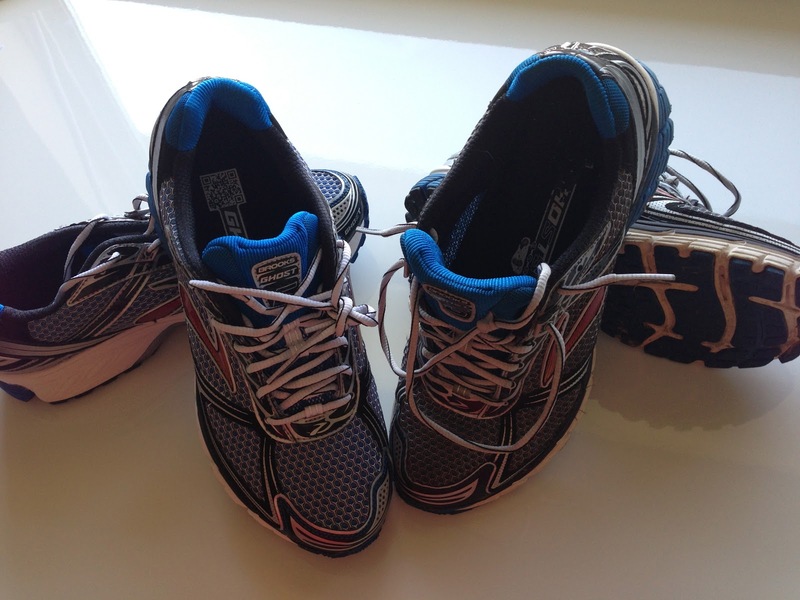 Out with the Old, In with the new - Not really too exciting but who doesn't love getting a new pair of shoes? I had ordered these a week or so ago and they called on Tuesday to let me know they had come in. I tried on 10+ shoes when I went in but decided that nothing felt "right" so I just ordered another pair of Brooks Ghost 5, I put 640 miles in my previous pair. I managed to get in 7.5 miles this afternoon in my new shoes! 4. Group Run with Ultra VT - Tuesday evening was my second outing with the Virginia Tech Ultra Club. I went out on a run with the group on Thursday evening but my legs did not cooperate and I quickly decided I wasn't going to hold them up, not on my first outing and definitely not in the dark. My graduate class was cancelled Tuesday evening which allowed me to make the Tuesday evening group run I normally can't do and the run was slightly more suited to my style. On Thursday, the first 1.5 miles of the run are very steep, something I'm not a big fan of, I prefer rolling and steady climbs but Old Farm is a different beast. Yesterdays run started with a decent climb but then turned into rolling hills on a fire road before we headed down the mountain on a trail. We managed to get in just under 1300' of climbing in 8 miles. 5. I REGISTERED for the Promise Land 50K - Today, I put my check and application in the mail for the Promise Land 50K which is a race held at a youth camp between Bedford and Big Island, Virginia on April 27th. This will be my first ultra of the year. I know that it will be challenging but I am motivated to train and believe that my fitness is there after Rock 'n' Roll USA. 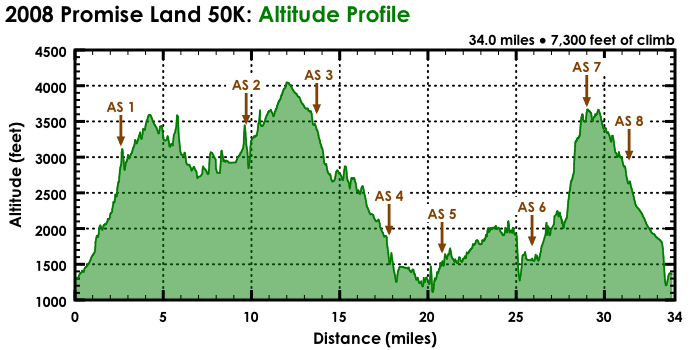 The course features nearly 8000K feet of elevation gain, and an equal amount of descent, which is more than I have ever done in a race but YAY for new frontiers! Why Pre Still Matters via Runners World - I really enjoyed this article and it was a different perspective on the all-mighty Pre. Whether you love him, hate him, or are indifferent - the article makes you think. This year, Nick Hollon and Travis Wildeboer finished the Barkely Marathons in Frozen Head, TN. They finished in 57:41 and 58:41 - those are hours and minutes just in case you were confused (so ~2.5 days of running), breaking the course record and making the 13 and 14th finishers. Ever. The race has been held since 1985 (although it was 55 miles then and later evolved to 100 miles) and had a total of 12 finishers prior to Monday. The NY Times wrote a piece about the race and like some hipsters "they knew about it before it was cool." A funny, April Fools' day, article about changes at Western States (the Boston of Ultrarunning). 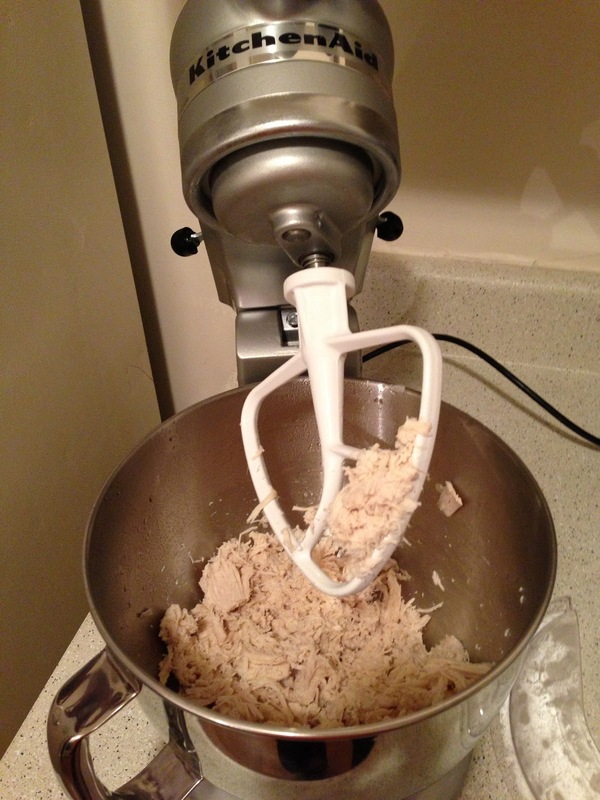 Posted by Unknown at 7:45 PM I'm reading from MyDailyGround: Where's Waldo Wednesday - 3/27/13-4/3/13 Tweet this! Great update. Wish I had your energy (and ability to eat as much) Very proud of you. Dad.